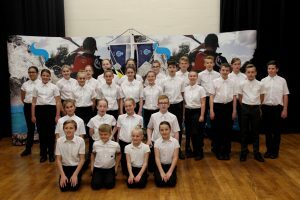 A school in Broughton Astley has got on board with supporting the Armed Forces Community while officially launching an already successful Sea Cadet unit. Thomas Estley Community College, on Station Road, signed the Armed Forces Covenant last night (Monday 25 September) on the first Enrolment Night for the Broughton Astley Sea Cadet unit. It was launched at the school three months ago following conversations about creating more activities for young people in the village. Already over 100 10 to 18-year-olds have put their name forwards to become cadets. To meet demand the adult volunteers who oversee the unit have already expanded to two evenings a week (Monday andWednesday) and there’s a waiting list of over 50 children looking to join. On the night the first 26 cadets were officially enrolled into the Sea Cadets Corps. Lieutenant Shane Daly, has helped set the unit up in his role with the Corps as regional Development Worker which aims to expand cadet opportunities within schools across the region. He said: “We’ve been absolutely delighted at the response we’ve had to Broughton Astley Sea Cadet unit. “It’s brilliant how it has grown through word of mouth to the point we’ve put an extra day on and already have a waiting list of cadets. 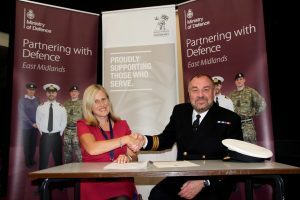 College Principal Mandi Collins signed the Armed Forces Covenant alongside Commander Martin Clegg, a representative of the Royal Naval Reserve. By signing the covenant the college has shown both their commitment and flexibility to employing current and former service personnel and their families. Explaining why the college wanted to sign, Mrs Collins said: “Our core values, as ‘a community of courage and commitment to success’ with a focus on leadership, resilience, respect and community, match closely with those of the Armed Forces. 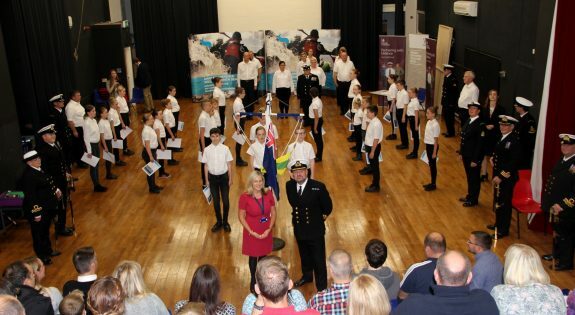 Catherine Suckling, the Ministry of Defence’s Assistant Regional Employer Engagement Director for the East Midlands, explained: “I was delighted to attend the signing event at Thomas Estley Community College and it was a pleasure to see so many bright young people thrilled at officially becoming Sea Cadets. “The school have been hugely enthusiastic of the Armed Forces community. They employ a number of Cadet Force volunteers who in their spare time are making an important contribution to the lives of young people in their community. Broughton Astley Sea Cadet unit meets at Thomas Estley Community College on Monday and Wednesday evenings between 7pm and 9.30pm. For more information visit www.sea-cadets.org or search for Broughton Astley Sea Cadets on Facebook. “It’s brilliant how it has grown through word of mouth to the point we’ve put an extra day on and already have a waiting list of cadets."